Yesterday, I reported on the effect of the shutter modes on the a7RIII on the digitizing precision. In this one, I’ll extend that discussion to the way the shutter modes affect the read noise (RN). I’m going to show you some graphs of Engineering Dynamic Range (EDR), which is another way of looking at RN. EDR is defined as full scale divided by RN. I’m converting that ratio to stops, by taking the base-two logarithm of it. I’m using ES as the abbreviation for electronic shutter. Sony calls is Silent Shooting, but I prefer to reserve SS for single shot shutter mode. The vertical axis is the EDR in stops. Higher is better. 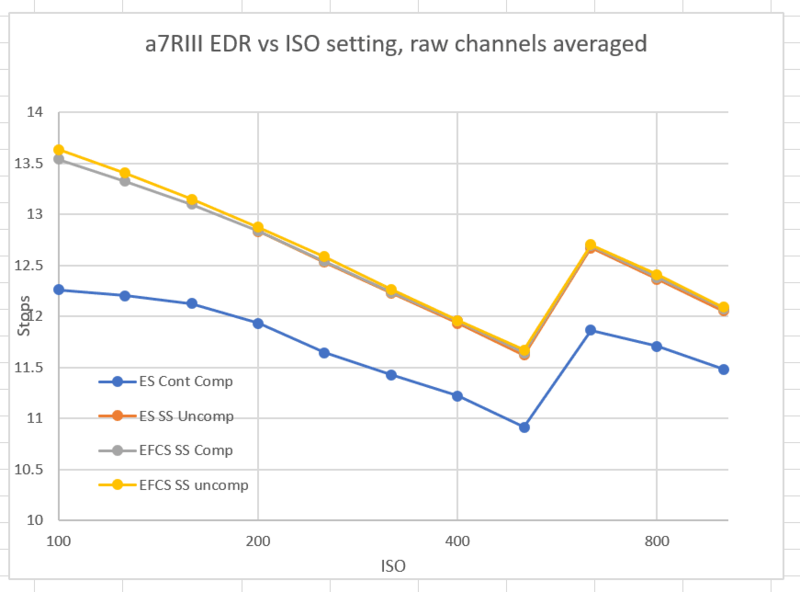 You can see that the EDR is the highest at base ISO for EFCS, single shot, uncompressed. 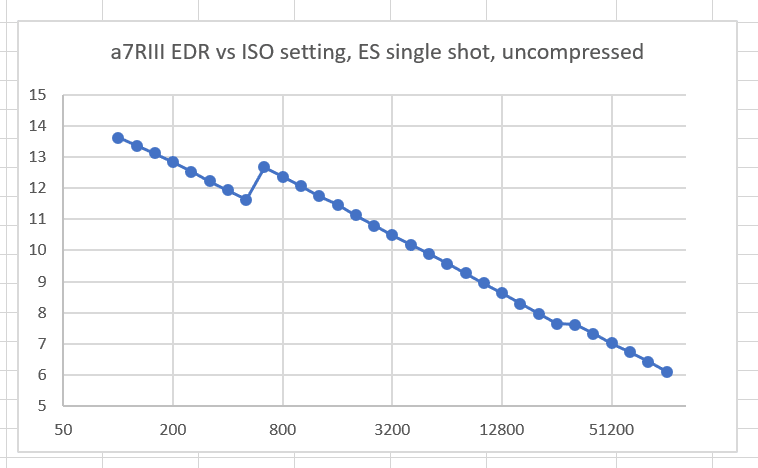 What you can’t see is that the base ISO EDR for ES, single shot, uncompressed is the same. In fact, all across the ISO range shown, the electronic shutter and the mechanical shutter give virtually the same results for uncompressed files. 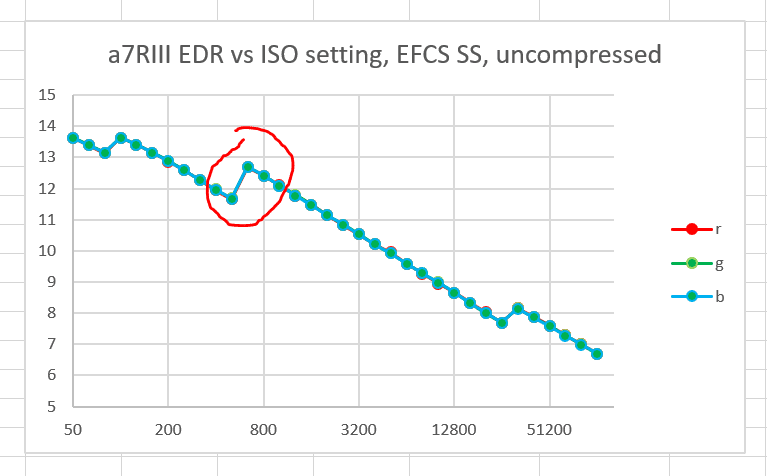 When using EFCS and staying in SS , going to compressed mode extracts a tiny EDR penalty (you’ll never see it in real-world photography) at low ISOs, and has no effect at higher ISO settings. Using the electronic shutter continuous compressed mode has a negative EDR effect that is somewhat more than one stop, but that’s what you’ll have to live with is you want the 1/30 second electronic shutter scan time. 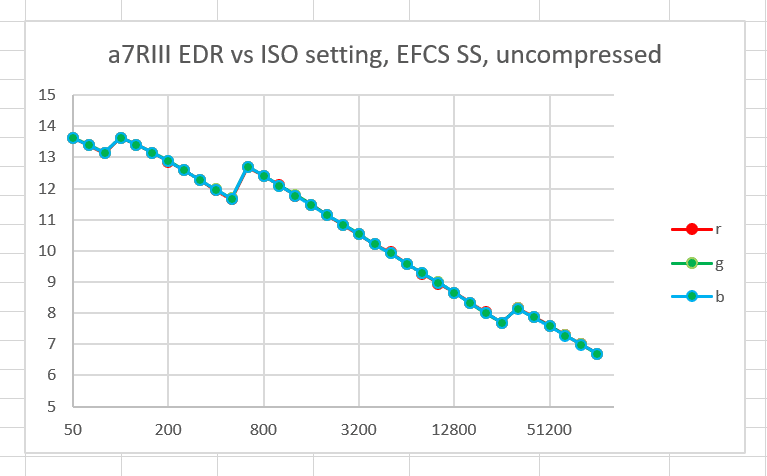 Not shown is EFCS continuous compressed; it looks the same as ES at those settings. Many of you will want to stop right here but read on if you want the details. I’ve plotted the results for the red, green, and blue raw color planes. You will be forgiven if you see no difference; there is none to speak of. There are three regions of the curve that need a bit of explanation. 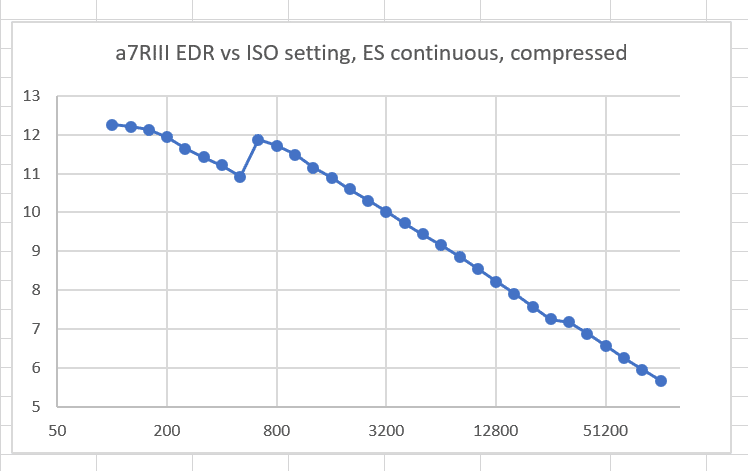 The first is EDR at ISO settings below the base. I call these “fake ISOs”. They do not reduce the sensitivity of the a7RIII sensor one whit. All they do is bias the exposure settings. My suggestion to you remains the saem as for all the other a7x cameras: don’t use ISO settings below 100. If you feel the need to allow more exposure, use manual mode of the exposure compensation dial. The next is the bump in EDR that happens when you change from ISO 500 to ISO 640. This is not fake at all. It is very real and very useful, and stems from the DR-Pix technology that Sony licensed from Aptina some years ago. That technology allows Sony to increase the conversion gain at ISOs above 640, and thus reduce the read noise. The last is the increase in EDR that happens at nose-bleed ISO settings. This is fake, too. Sony uses digital spatial filtering at these settings to reduce noise. You can do the same in post-production, with a lot more control. My advice is to not use these ISO settings. The camera does not allow the fake ISO settings in this mode. The bump in EDR at the very high ISOs is less apparent. Otherwise, six of one and half a dozen of the other. The only salient difference from the single shot uncompressed curve is a very slight downward bending as you approach ISO 100 from above. Although Sony is no concern of mine, I think it’s very beneficial to your readers when you give practical advice on how they can get the most out of their cameras. Thank you for them. And when you start banging on the D850 again, thank you from me. Practically everything Jim does here is very beneficial to this reader who is 50-50 Nikon-Sony. Could we please see a chart with single shot drive mode but compression on? 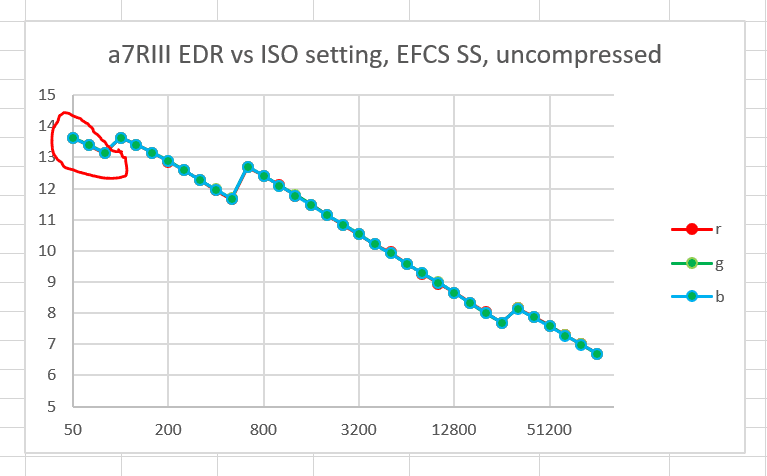 It would be nice to see the effect of compression on edr. Both last and third last charts have titles ending with “EFCS continuous, compressed”. Is the third last one supposed to say uncompressed? If so the text may need some updating too. Thanks for all the wonderful painfully researched work! 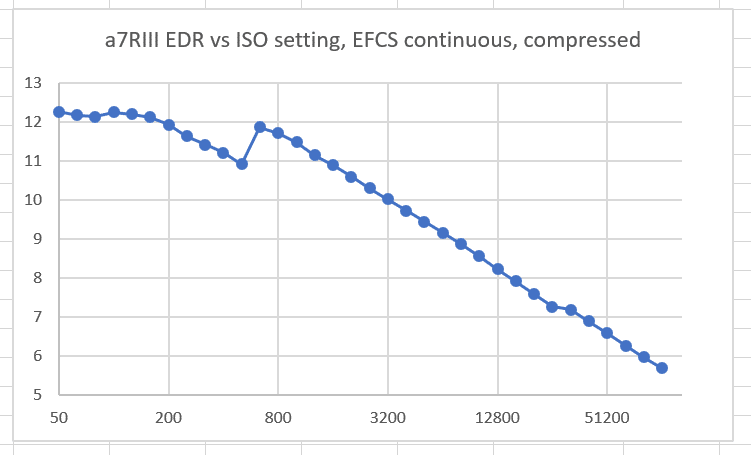 I could swear there are two contradictory graphs for EFCS with continuous shooting and compressed raw files? Or am I getting senile? You are right. Fixed now. See below. They have the same heading, is one of them mislabelled? This is the first and last time I shoot all the different modes at the same time and analyze them later. I apologize and have corrected the images and the explanations. I mixed up the continuous EFCS compressed with the single shot EFCS compressed. 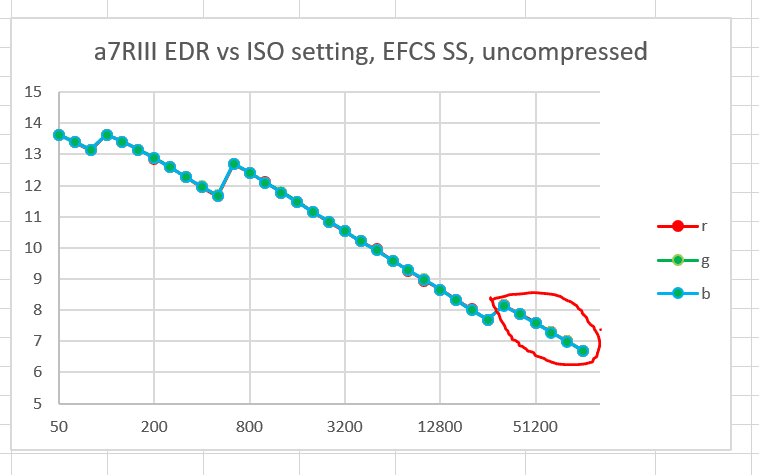 How about uncompressed, ES and continuous bracketing? I use that a lot in the field and wonder if there is a significant penalty… It should not matter that much since bracketing captures lots of data but it would be interesting to know. This is also the question I am looking for an answer to. 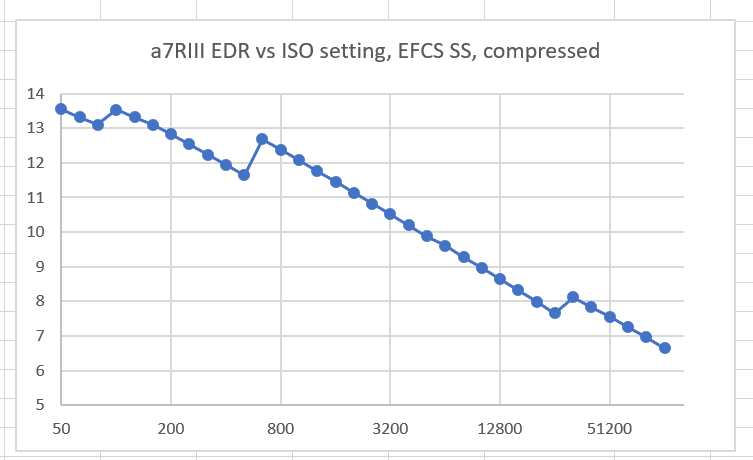 If my memory is correct, the a7RII had lower EDR in all continuous shooting modes, and also in all of the electronic shutter modes. 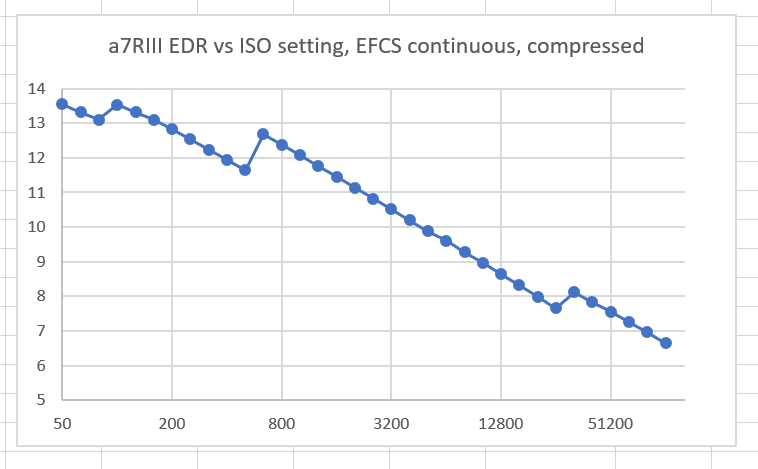 From this data it looks like they have “fixed” some of the electronic shutter modes in the a7RIII so they do not have the EDR penalty. I’d really like to know if that is also the case for any of the continuous shooting modes. Like Fred, I like to shoot in continuous bracketing, and I am curious if there is an EDR cost associated with this decision. The sony A7R III can only use ES and Bracket Exposure in compressed RAW. I’m also hoping that Jim answers the question. How’s the EDR and Noise using ES Cont. Bracket Compressed? So the bottom line is to shoot uncompressed is that what you are saying? And I assume when you have the chance to try and shoot at ISO 100 & 640 correct? What about uncompressed and continuous – does that take a penalty also?